Canada has made a strong and bold commitment to position itself as an international leader in the health, rights and well-being of women and girls. In 2017, Global Affairs Canada—the Canadian government department that administers international assistance under the new Feminist International Assistance Policy—dedicated CA$650 million (US$506 million) over a three-year period (2017–2020) for the sexual and reproductive health and rights of women and girls. This funding comes in addition to Canada’s 2015–2020 commitment of CA$3.5 billion (US$2.7 billion) to maternal, newborn and child health, which also includes components of sexual and reproductive health services and information. Sexual and reproductive health and rights are essential for sustainable development, gender equality and women's well-being; maternal, newborn, child and adolescent health; and economic development and environmental sustainability.1 A comprehensive package of sexual and reproductive health services includes contraceptives and maternal and newborn care, as well as other indispensable services, such as safe abortion care, comprehensive sexuality education, gender-based violence interventions and services to meet the needs of neglected populations, e.g., adolescents and people in humanitarian crises. Addressing the full range of sexual and reproductive health and rights needs of all people throughout their lives is essential to ensuring a healthy society. Family planning is a fundamental component of comprehensive sexual and reproductive health. Ensuring that women control their own fertility benefits women, their children and their families. Empowered decision making means fewer unintended—and often high-risk—pregnancies and fewer abortions, which are often performed under unsafe conditions in developing regions and countries with restrictive abortion laws. It also makes for healthier mothers, babies and families, and pays far-reaching dividends at the family, society and national levels. Family planning is one part of Canada’s comprehensive program to promote sexual and reproductive health and rights. 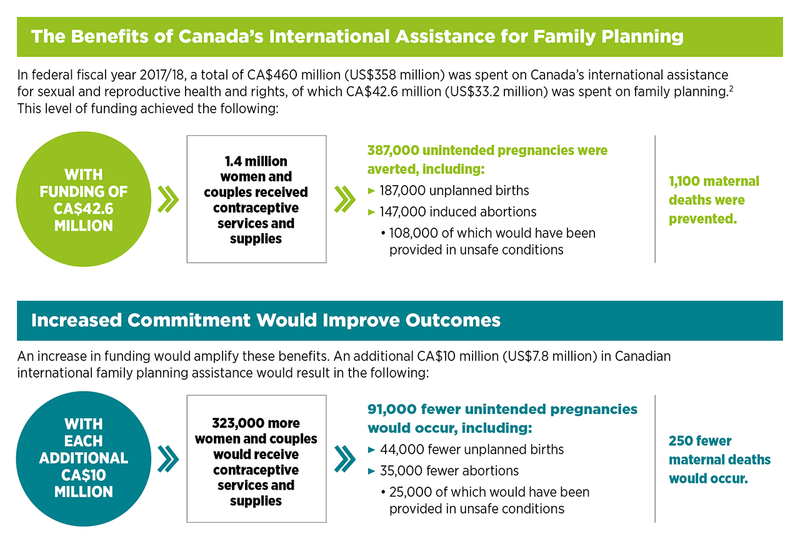 This document analyzes the family planning component of Canada’s commitment and Canada’s potential to take further action to enhance its role as a world leader in sexual and reproductive health and rights.